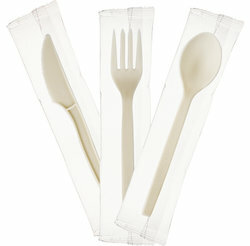 Eco-Friendly Individually Wrapped Utensils (750 Count). A great options for your break room utensils. Each box contains 750 individually wrapped utensils that are made from Plant Starch. This is a medium weight utensil and each is 7 inch. Made of 70% Renewable Resources. Each box has 750 individually wrapped 7 inch utensils. Choose below.